Home » Land » Wildfire! On my vacation, I encountered wildfire in 3 national parks. What does it mean? As I drove north, I encountered another cloud of heavy, brown haze, this one over lightly populated land near Lake Frances. “This can’t be air pollution,” I thought. “It must be smoke from a wildfire somewhere.” And, indeed, it was. 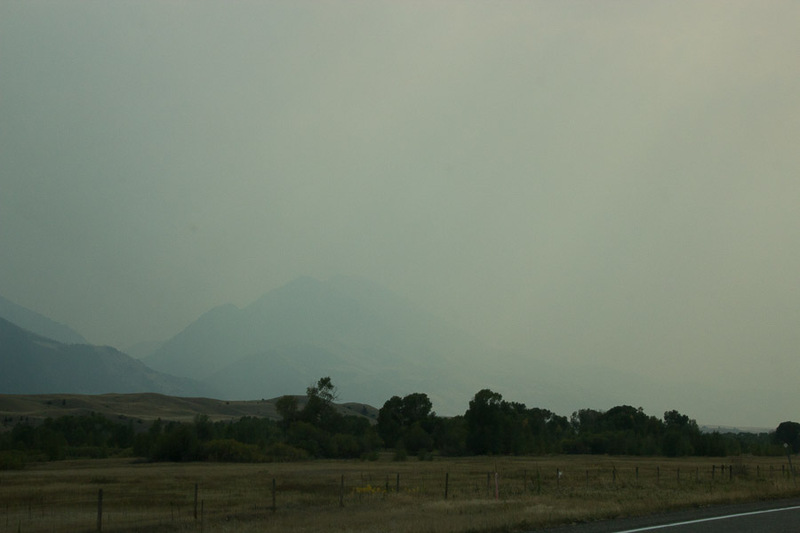 I encountered wildfire and/or its effects in all three national parks. Figures 1, 2, and 3 show smoke near Gardiner, hanging in front of Mt. Moran, and filling the Yellowstone River Valley. Figure 1. 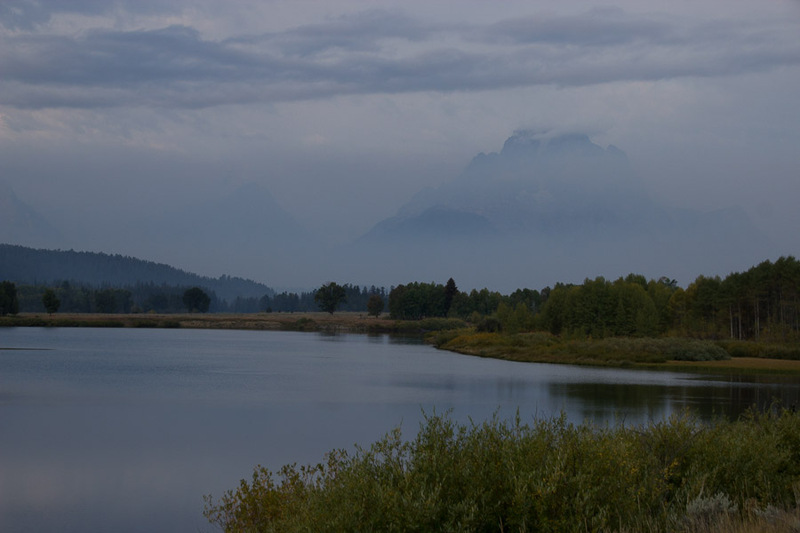 Smoke Obscures the Mountains Near Gardiner, MT, 8/31/16. Photo by John May. Figure 2. Smoke Obscures Mt. Moran, 9/12/16. Photo by John May. Figure 3. Smoke Hangs in the Yellowstone River Valley, 9/3/16. Photo by John May. I asked a ranger, and found out about Inciweb, the interagency system for information about many kinds of risk, especially wildfire. I discovered that 8 wildfires were burning in regions of Montana and Idaho just upwind from Glacier National Park, that 5 were burning in Yellowstone National Park itself, and that one was burning in Grand Teton National Park. 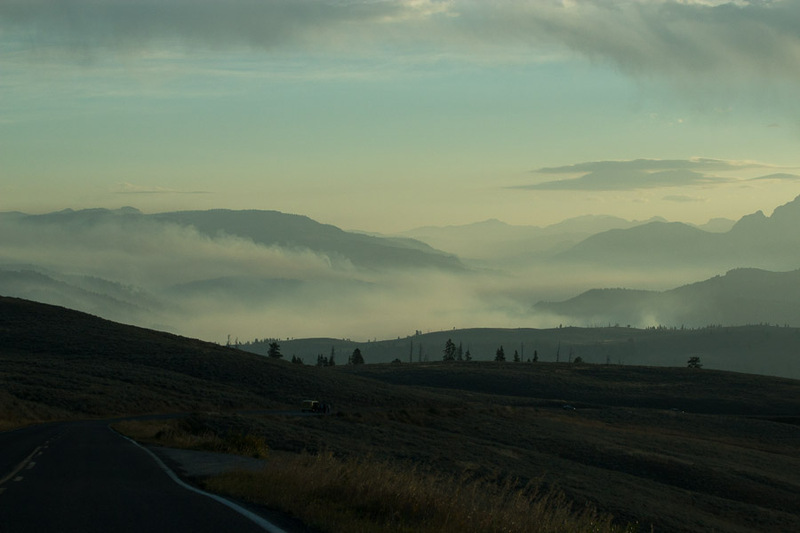 This last one, the Berry Fire, twice burned across the highway between Yellowstone and Grand Teton, forcing its closure. Fortunately, I was able to sneak through during the brief period between the two closures. I also discovered that none of these were the worst wildfires of the season; those were burning in California. Figure 4. Crown Fire Approaching Old Faithful Photo Shop & Snow Lodge. Photo: Yellowstone National Park, photographer unknown. Wildfire sometimes makes for dramatic news stories with spectacular photographs. 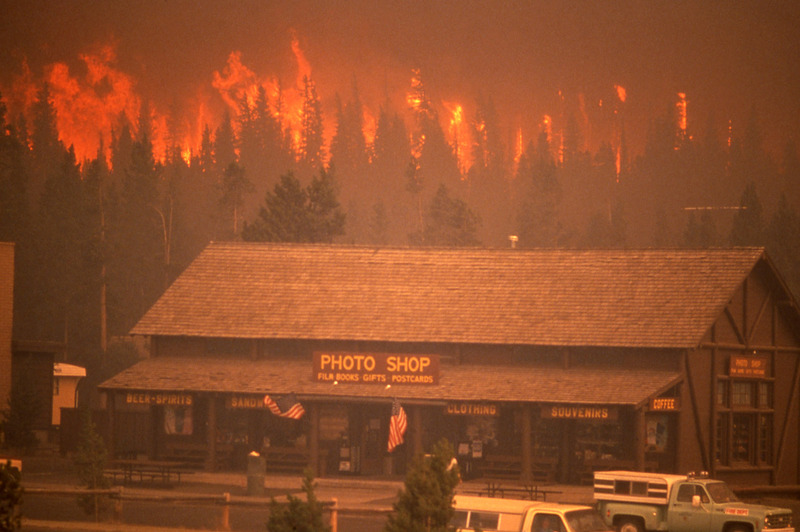 Perhaps many readers can recall the wildfires in Yellowstone National Park that made national headlines in 1988 (See Figure 4). Yellowstone was devastated, they said, it would never recover. Guess again, smoke breath! Raging crown fires like the one in the photo are the exception. Most wildfires present a much more complex story. All three of these national parks have been heavily affected by wildfires, but they are far from dead. In fact, in some ways, they are more healthy now than before the fires. On the other hand, a Forest Service publication notes that in the last 25 years, wildfires have increased in size and ferocity. What’s going on? In the following posts, I hope to share with you the role that wildfire plays in a forest ecosystem, look at whether wildfires are getting larger, more fierce, or more frequent, and how wildfire has impacted Missouri. I found it a fascinating topic to explore, and the evidence was right in front of me. Hopefully I can share it with you in a way that will interest you, too. Forest History Society. 2016. “U.S. Forest Service Fire Suppression.” Downloaded 9/30/2016 from http://www.foresthistory.org/ASPNET/Policy/Fire/Suppression/Suppression.aspx. Photo of fire approaching Old Faithful Photo: “13744.jpg.” Unknown photographer. Wildfire, 1988 – Crown Fire. Yellowstone’s Photo Collection, Yellowstone National Park. Downloaded 9/26/16 from https://www.nps.gov/features/yell/slidefile/fire/wildfire88/crownfire/page-1.htm. By mogreenstats in Land, Other Land on 2016/10/20 .